This post is for my sister Jen. She has huge marigolds growing in her garden and recently harvested 4 of her plants. She had almost a grocery bag full of flowers and still had a bunch left in the garden! "Calendula is the genus name of a flowering plant more commonly known as the marigold, which is not only an attractive border plant, but is edible and has useful medicinal properties as well. Be warned, however, if you want to collect and dry your garden marigolds for herbal uses, that a number of other plants are also called 'marigolds'. Make sure yours are true Calendula officinalis before drying or eating them. Calendula flowers and leaves are edible and make an attractive addition to salads and soups. The flavor is usually slightly bitter and can add a tangy or tart flavor to your usual greens. Calendula has a long history as a healing herb, most notably for the healing of wounds. It has antiseptic, antibacterial and antifungal properties that prevent infections, and it can support coagulation and scab-formation in sores that resist healing. For this reason, it is contraindicated in wounds that need to remain open until all the infection has drained away, since it may cause premature scabbing that would necessitate reopening the healing wound. Calendula can be applied as a poultice - a warm mash of the flowers held in place with a cloth - over wounds to stop bleeding, aid healing and prevent infection, and was a common battlefield first aid during the nineteenth century and beyond. Calendula was also widely used in tinctures, or herbal extractions with alcohol, and infusions, or teas made from the dried herb." "Used since Roman times, calendula (Calendula officinalis) has a centuries-old reputation as a wound healer. The bright yellow and orange blossoms contain volatile oils, tannins and resins that calm inflammation; speed healing; and have antibacterial, antifungal and antiviral properties. In recent studies, calendula has been proven to help heal venous leg ulcers, which are notoriously slow-healing wounds caused by poor circulation. Calendula often is a primary ingredient in herbal salves for skin rashes, diaper rash, minor cuts and burns, and chapped lips. A strong tea made from calendula blossoms makes an excellent footbath for athlete’s foot, a facial wash for acne, an eyewash for conjunctivitis, a mouth rinse for aphthous ulcers (canker sores) or a vaginal wash for yeast infections." It's a pretty Awesome plant! Calendula is easily grown from seed and may be sown directly in the garden from early spring on into summer, with plenty of time left to get a good harvest of flowers. 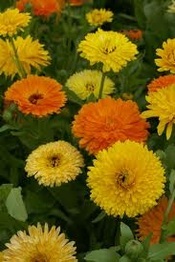 Tolerant of poor soils, calendula will grow in partial shade or full sun. The plant requires regular watering. Sometimes known as “pot marigold,” calendula is easily grown in pots on the doorstep or in window boxes. Ideal for children, the seeds are large and easily handled, and germination is almost assured even if planted by the inexperienced gardener. Sow about ¼ inch deep and pat down the row. Keep weeded and thin to 6 inches to 1 foot apart. The first flowers are produced only 40 to 50 days after seed germination. Calendula is also a great Companion Plant. *Don't forget, October 4th at Back to the Basics! The Salsa Garden Giveaway! I LOVE Marigolds! Our mom used to plant them in her garden! We are now following you from the blog hop! Such a wonderfully helpful post! - thanks so much for all of the info. Stopping by from Couponing & cooking blog hop. Wow, I never knew that. Thank you for posting at my Our Favorite Things Link Party. Hopping over from Inspire me Monday. Gosh you do learn something everyday. I'm glad I got to read this post! Thanks so much for sharing on "I Gotta Try That Monday"
I've noticed that calendula is often included in the baby care items I have for our daughter. It's a great way to keep animals out of the garden too. I didn't know that marigolds and calendula were the same thing! What a powerful flower and informative post. Thank you. Wow, it's always amazing to learn of the wonderful things God gave us in His creation! We don't have to settle for chemical/artificial substitutes. Thanks for sharing at A Humble Bumble! I love marigolds, but I never realized that they were the same as calendula. Great info, thanks for sharing at The Fun In Functional! LIke th others, I never realized they were (mostly) the same plant! I have a calendula moisturizer and love the smell of it! As you know, I host the Photo Friday Blog Hop and welcome you to join up with this or any other post you think readers would enjoy. Hope to see you there. Cheers! Amazing! These would look beautiful on a salad. Thanks for sharing at Mom's Library! I didn't realize marigolds had health benefits. I have only used them to keep the critters out of the garden. Thanks for sharing on Tout It Tuesday! Hope to see you tomorrow. Hello...stopping by from Anne's TALU and found your post very interesting being that I am in the medical field AND I love flowers and gardening as well. Thanks for the info!! How interesting! I've eaten rose petals, but never marigolds. Now you've got me curious. Thanks.